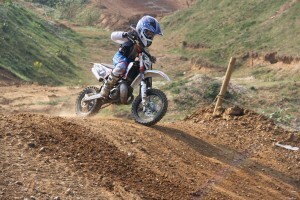 Here is the latest instalment from Matt Brooks and his motorcross rider son, Daniel. We have been really busy since I last spoke, doing lots of training and participating in three race meetings achieving some really good news about qualifying for the schoolboy nationals, but I will come back to that later. Here are all the events from the first race! 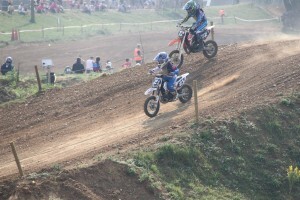 This blog is about the races at Wildtracks Moto Park in Chippenham, not far from Norwich, which was one of several qualifying meetings for the schoolboy national finals later in the year. With some of the country’s top riders descending on Wildtracks for a great weekend of racing in the glorious sunshine, it was no surprise all the riders came off the track very red faced and sweaty to say the least . Dan had a great start to the day after a great start in the first race, but he got taken out on the second corner and was a good half a lap behind the rest of the field by the time he got going again. However, in great style he worked his way up to the backmarkers and started cutting his way through the field, eventually finishing in a respectable 12th place out of a starting line up of 27 riders. In the second race Dan didn’t get such a good start, despite having no crashes this time. Bearing in mind some of the fastest riders in his age group were in this meeting he managed to tag onto the back of the leading group to finish in a great ninth place having had a couple of great battles in the process. To give you an idea of the leading groups pace they lapped up to 13th place! In the last race, again, Dan had a great battle hanging onto the back of the very fast leading group finishing in 9th place resulting with him earning an impressive 10th place overall and a great chance to qualify for the semi-finals of the nationals, which will be held in June. 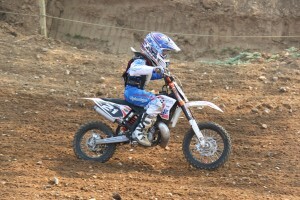 Something we have to note when looking at Dan finishing in the places he is; Dan is one of the youngest riders in his group having moved up to the 65cc group a year earlier than he needed to, he is racing children that could be up to 3 years older than him and could have been riding the 65cc bikes for that length of time, with that in mind his results are quite outstanding! I look forward to hearing how Daniel gets on in his upcoming races! Anglian Home Improvements supporting communities across the UK. Visit the Anglian website for information on our new EcoGain windows.